Those plump roma tomatoes caught my eye. Within moments they were sliced about 1/8 inch think and spread out on one of my racks. 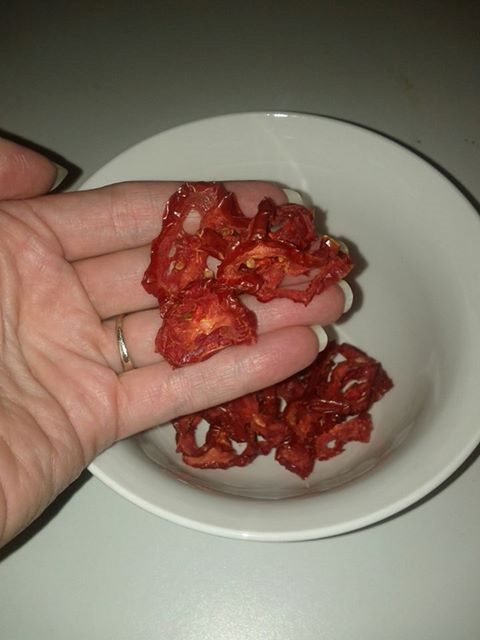 At 125 degrees and about 6 hours later, we had dehydrated tomatoes. I took a bite. Indeed, the sweetness of the tomato had condensed into these slightly chewy little rounds of goodness. And now I know how to turn the world’s undercover fruit into a sweet snack!